Using Userlike for chatting live with your website visitors is great, and it's an awesome way to provide support or explain your product. Normally, Userlike sends you an email after each chat session with a chat log, so you can keep it for future reference. We thought it would be great to store these chat logs in Planio Help Desk as issues instead, so you'll have everything neatly organized by contact and so you'll be able to see support issues from Planio side-by-side with Userlike chats. You'll be presented with a configuration form. We'll get to that in a minute. Let's figure our your Callback URL first! This part gets a little technical. But don't worry – we'll get through this. https://acme.plan.io/projects/support is the full URL to the designated project where you activated Planio Help Desk. You can copy it from your browser's address bar when you're on the Overview tab of your project. acme.plan.io is your Planio domain and support is the project's Identifier. ?key=abc123 is a secret key for authentication purposes. In Planio, please navigate to your avatar → Administration → Settings → Incoming emails and find the key in the field labeled Incoming email WS API key. Now, replace abc123 in your URL with your actual key. Select for Offline Messages if you would like to receive messages in Planio when you're offline in Userlike Chat and a website visitor leaves a message. Select for Chats if you would like to receive actual chat logs with your website visitors in Planio. Please leave all other checkboxes unchecked and finally, click on Update settings. And that's it! You can go ahead and try it out now. Any chats and/or messages from Userlike will show up as issues in Planio Help Desk. 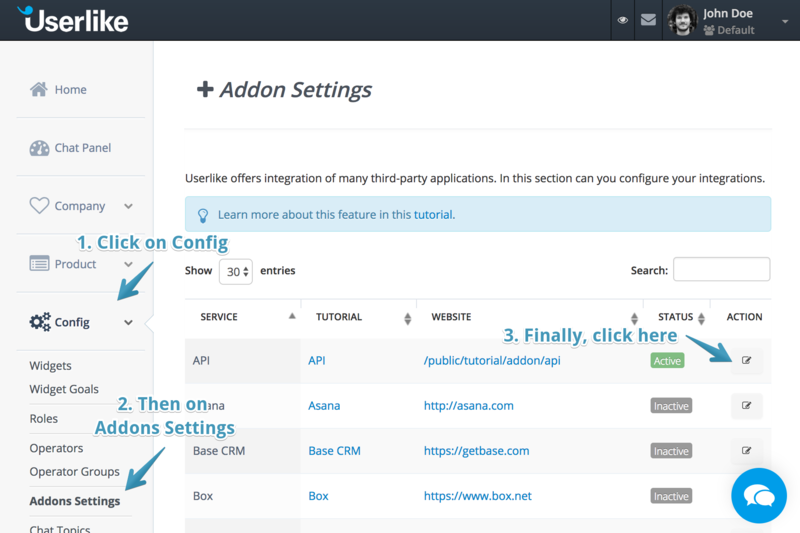 Of course, we have some more advanced config options for you if you think building the URL above was fun! You can add any of the following parameters to your Callback URL to further configure how Planio issues will be created. Please add each parameter as &key=value to your URL and replace key and value appropriately. status_chat_meta The name of a Planio issue status to be set on the issue for chat logs. If you merely want to archive chat logs to have them available in your customer history and in search, you could select a Closed status here. category_chat_meta The name of a Planio issue category to be set on the issue for chat logs, for instance Userlike Chat. status_offline_message The name of a Planio issue status to be set on the issue for messages you've received in Userlike while offline. Use an Open status like New or In Progress here, you'll be also able to respond to messages right from within Planio Help Desk! category_offline_message The name of a Planio issue category to be set on the issue for offline messages, for instance Userlike Message. and with a Status of Open and a Category of Userlike Message for offline messages. That's it! Have any questions? Get in touch with us – we'll be happy to help set up the Userlike integration with you!